EC-Council launches NEW Academia courseware to build a new Cybersecurity workforce! Panel Discussion in Information Security Governance, Compliance and Regulation with Dr. Abdul Muin Abdul Rahman, Senior Managing Director, Malaysian Nuclear Agency, Leong Chai Kin, Director of Technology & Systems at Bursa Malaysia Berhad, Jay Bavisi, President and CEO of EC-Council, Amirudin Bin Abdul Wahab, CEO, CyberSecurity Malaysia (CSM) and Dato’ Arif siddiqui, CIO of Standard Chartered Bank Malaysia. EC-Council Asia is delighted to announce the successful completion of the first ASEAN CISO Summit 2016 hosted by EC-Council Global Services (EGS), the Cyber Security Consulting and Advisory arm of the EC-Council Group. Everyone who attended the CISO gathering, many of whom traveled long distances to be part of the first forum of the annual CyberSecurity Malaysia’s Conference, Awards, and Exhibition (CSM-ACE), left the event with increased knowledge and motivation. EC-Council has a strong tradition of hosting executive events benefiting the leaders in information security through the globally renowned CISO Events Program. Every year, Global CISO Forums and CISO Summits bring together thousands CISOs and C-Level executives of both public and private sectors from around the world to address mutual challenges and share insights on executive information security leadership. This year’s event brought together the top one hundred Chief Information Security Officers and decision makers from around the region for six panel discussions and two keynote sessions. The topics discussed focused primarily on information security governance, compliance, regulation, planning, financing, and management. The audience had the chance to interact with the speakers throughout the entire event by participating in the Q & A sessions and real time polls on Sli.do. Using the Sli.do platform, it was found that over 50% of participants believe lack of leadership skills in Information Security is one of the main reasons cyber security threats have been evolving tremendously in Malaysia. Another vast majority (71%) believes that engaging the board proactively would help mitigate those risks. There is no surprise then that an overwhelming 86% responded that CISOs responsibilities should be assigned and managed by the Chief Executive Officer directly. Throughout the world, a growing number of organizations have a CISO in place, however, Malaysia still ranks very low in catching up with this security leadership trend. 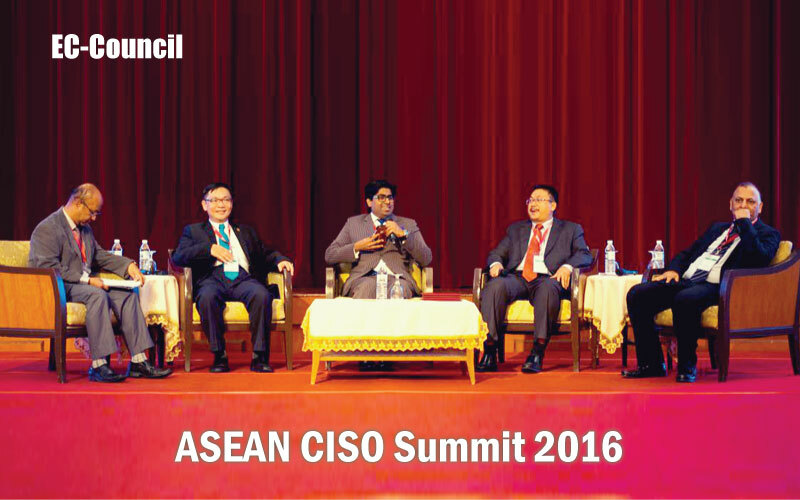 The ASEAN CISO Summit aims to increase awareness around the CISO role by bringing together current and aspiring security leaders. The goal of the Summit is to drive information security in the ASEAN region by fostering a community of dynamic and informed information security leaders. The Summit was followed by the ASEAN CISO Workshop, a closed-door premium training that addresses the aforementioned gaps in the national information-security leadership landscape. Cybersecurity experts who attended had the opportunity to practice their leadership skills and obtain the C|CISO title which was ranked 4th in the world’s top-salaried certifications. (Cert Magazine 2016).